It has now been nearly a month since my iPhone committed suicide, jumping out of my pocket’s safety and into the shallow water of a sandy-bottomed pond. I stuck it in a bag of rice, desperately trying to revive it, but it was a goner. I even drove it to the local i-Hospital where engineers dressed as surgeons performed medical…err..mobile miracles on the device only to return it to me in a halfway usable state – it has no Wi-Fi, shaky Bluetooth and no functional USB port. It can’t sync with iTunes, but it can charge via the wall outlet. In the meantime, I’ve decided to stay with Android for a bit longer than I anticipated. The Nexus S, that is. The demo unit sent to me by Google is now being replaced with one I’ve purchased. I’ll admit, I’ve been struggling with the transition: abandoning iTunes, no more Netflix streaming, and I’ve left behind hundreds of applications tucked inside folder after folder on my iPhone’s homescreens. How will I ever survive? If you’ve been following my transition, you can start here with my one-week review. This is an ongoing series. ?Surprisingly, I’m learning to live in Android’s universe – and it’s different over here, to be sure. Turn off Wi-Fi when you’re not using it, turn off background sync, try changing network settings to GSM instead of Dual mode (if I was on AT&T), shut off Live Wallpapers, try a custom ROM, “bump” charge the device, check the Battery Use settings page to see what’s draining it, kill all the widgets it has running, turn down the screen brightness, turn off all push notifications, turn off notifications on just the Facebook app, and lastly, turn off the GPS. There were more, too, but that’s all I can remember off the top of my head. All of these are valid tweaks for dealing with battery drains, and for someone, each tweak ended up being a lifesaver, I’m sure. However, for me, I had to shut off Twitter sync. Although I could change the interval to a longer period (it was already set to an hour), I chose not to. 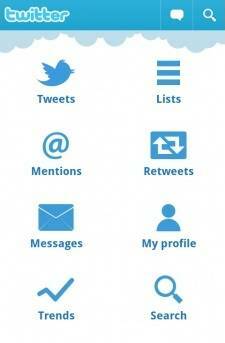 I don’t see the point in having Twitter sync every 2 hours, or every 4. It’s supposed to be real-time. If it can’t handle that, then I guess I’ll check it manually for now. But once that setting was turned off, the battery was saved. Well, it was vastly improved. To prolong the battery life, I’ve learned to do this little dance with my phone. Arrive somewhere, turn on GPS, check-in on Foursquare, turn off GPS. Turn off Wi-Fi, if none present. Turn on Wi-Fi when I get back home. Turn off Sync when I’m worried about the battery draining too quickly and I’m far from home. Turn everything off if the phone is going to sit around for a while, unused. Turn Auto-Brightness on, turn it off. Turn 3G on, turn it off. Over and over, I’m tapping the little Settings widget. A Settings widget shipped with the phone, in fact, and there are tons of third-party widgets that do the same. Does any Android user not have one of these installed? Unfortunately, it is a big deal. Or at least it should be. Our mobile devices are supposed to be enhancing our lives – we’re not supposed to be catering to them and their needs. Location should not be the equivalent of a light switch, nor Wi-Fi, 3G or any other function. It should just be there, ready when you need it. But on the Nexus S’s still far-too-quickly draining battery, it’s something you have to think about. And that’s really too bad. Many people wonder if they can transition from one platform to the next because of the “significant” investment they’ve made in a number of mobile applications, now installed on their phone. For mobile gamers, that might be tough. For me, I’m surprised to say it wasn’t. As I mentioned previously, all the major apps are there. I initially installed a nice collection including Twitter, Facebook, Foursquare, Amazon, Kindle, Angry Birds, Barcode Scanner, Best Buy, Bump, CNET Audio, DoubleTwist, Dropbox, Engadget, FiOS Mobile Remote, Grocery iQ, IMDb, Google Listen, mSpot Movies, picplz, Pixlepipe, ShopSavvy, Skype, SwiftKey and Swype, Microsoft Tag, Tango, Target, Trapster, TripIt, TweetDeck, Waze, WeatherBug, Where’s My Droid and Yelp. I’ve now found a few others in the B-tier for Android too: Dolphin Browser, my6sense, Cinch, Rdio (although I’m using MOG for now), The Weather Channel, eBay, Movies from Flixster, Opera, Skyfire, GasBuddy, and a couple of others. ?As for the hundreds of apps I had to ditch to move to Android, I don’t miss ’em…much. Oh sure, there are a few I’d love have back: Netflix, of course, Instagram, Instapaper (there are some 3rd-party alternatives, though), CardMunch, and a few that entertained my 1-year-old. But as a non-gamer, I didn’t have to give up anything terribly expensive. Android has enough casual games to help me pass the time, but I’d probably launch Twitter instead, to be honest. Your mileage may vary, of course. 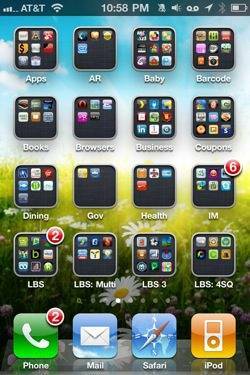 In looking back through iTunes now, I wonder: why so many apps? The ones I ended up using the most anyway: Google Voice, Gmail, Google Maps and Google Reader are all actually better on Android. However, there is one problem with the Android app universe, and it’s not the sheer numbers (Android has plenty now, maybe even 200,000 according to unofficial sources, half that of iOS). It’s not even the type of apps or the Market they’re sold in. It’s their technical merits. Over the course of the week, I’ve had at least five different apps totally crash on me. From a live wallpaper app to the popular SpareParts (a configuration tool I was hoping would help me diagnose battery troubles), the result was the same: launch, error, crash. The apps were unable to run. Curation, like Apple does, for all its Draconian undertones, prevents this sort of thing. As for my complaint about exiting the iTunes ecosystem – oh well. On Android, I’ve given up expecting to access a world of content from a single marketplace. 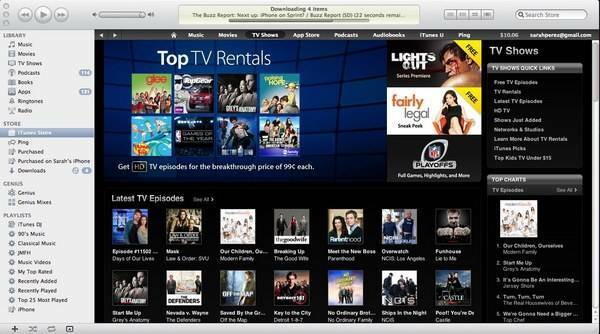 iTunes, however heavy and bloated its desktop software may be, is still the only place where you can buy music, rent or purchase TV shows and movies, subscribe and manage podcasts, buy audiobooks, buy ringtones, subscribe to free iTunesU educational programs and download apps, all in one place. To embrace Android, you have to let go. On Android, I stream music from MOG. I’ve downloaded MediaFly and Google Listen for access to podcasts – MediaFly has a good enough selection to keep me occupied for now…at least until DoubleTwist, the third-party “iTunes for Android” gets around to allowing podcast subscriptions on Mac. I’ve head DoggCatcher Podcast is nice, too, but I’m not purchasing apps on a demo unit, I’ll wait my own gets here. I don’t watch much video on Android, though. The occasional YouTube video, sure. But not TV shows, not movies. OK, let’s move onto something more positive. Once I let go of what my phone can’t do, I could finally start to focus on what it can do, for one thing: customization. Obviously, customizing your phone is of little importance to many users – but as a former iPhone jailbreaker, it appeals to me. I starting exploring the possibilities of homescreen replacements and new widgets and I’m really happy with the results. iPhone’s screen-after-screen of app icons now, in retrospect, seems tired, even old-fashioned, if such a word can be used to describe a technology only a few years old. 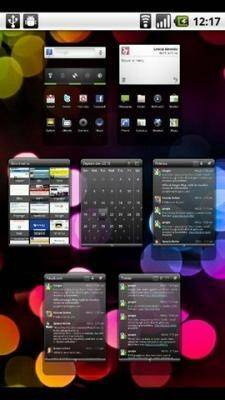 With Launcher Pro (note: again, not my phone in the photo – screenshots are hard on Android! ), I have a Mac Expose-like way to flip through screens. Just press on the Home button, and all your screens appear, letting you tap the one you want. (Slidescreen looks like a great alternative, too). And widgets! Oh the fun of having dashboard-like alerts on your main screen without having to hack your phone. I was never a fan of iPhone’s red notification badges anyway. They stressed me out like the unread count does in my inbox. 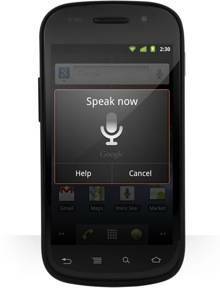 Another “killer” feature for the Nexus S is the microphone built into the keyboard. I’ve used this far, far more than I ever could have imagined. Maybe it’s because I’m a typical hectic, harried mother now, but my hands are always full. 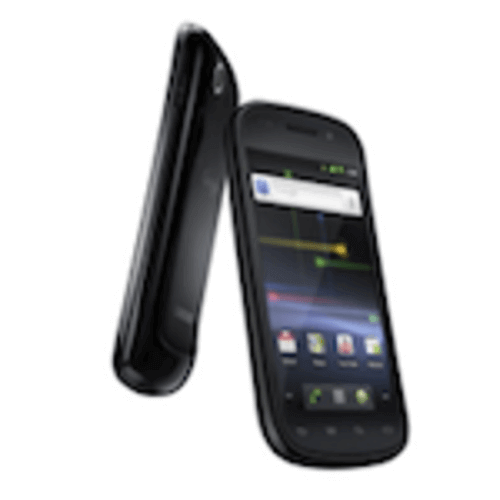 With the Nexus S, I can quickly respond to an email or send a text, just by speaking. The voice recognition is amazing. I didn’t even realize technology had reached this point yet, to be honest. I’ve mumbled, I’ve talked to the phone in the car with the radio blaring, I’ve said weird words, long phrases, and 9 times out of 10, the Nexus S gets it. And even when it’s not sure, it provides a list of suggestions for me to chose from. The word or phrase I said is usually there, or is very close. So Why Did I Go Android? But at the end of this month, I have to admit: Android is growing on me, despite the battery life, the iTunes-separation anxiety, and the Netflix withdrawals, the phone is more than usable. Notifications, widgets and better homescreens let Android perform information-delivering tasks better than iPhone’s pop-ups and badges, I feel. The ability to customize those features in ways that makes the information meaningful to me, instead of row after row of icons with red badges, is a huge improvement. I’m also intrigued by the possibilities of NFC (near field communication) technology. Today we saw the first NFC-enabled apps hitting the Android Market. Soon there will be more. And while I believe Apple is working on NFC, I don’t know its timeline for implementation. I know that Apple acquired Siri, a voice-enabled digital assistant, whose integration into iPhone could deliver wonderful things, but I don’t know its timeline for implementing that either. And Apple acquired Lala, a music streaming service that is the rumored basis for the so-called “cloud iTunes.” But again, I don’t know Apple’s timeline for this. Granted, when Apple does get around to releasing the iPhone 5 (6? 7?) with all these features, it’s sure to “magical,” if not downright near-perfect. But I don’t like to wait, I want these things now. With the Nexus S, that urge is satisfied. It’s a glimpse into the future Apple will one day mainstream thanks to the iPhone’s many users. Apple will probably even do it better. But it didn’t do it first. However, one final point about all this: without a better battery, it doesn’t matter how great the Nexus S and its brethen may be. A dead phone can’t do anything better than a phone powered on. This is still a sticking point for the Nexus S, and maybe for other Androids too. But for now, I’m wiling to experiment further. 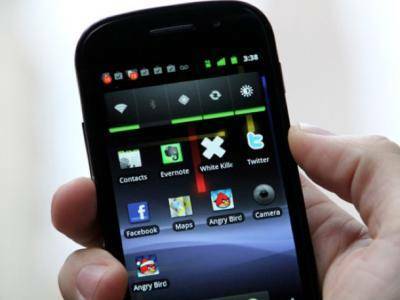 What aspects of Android, or the Nexus S, should I delve into next?